A Think Pink theme bridal shower is the way to go if she's a girly-girl, or a romantic at heart. Are her clothing, accessories, room, or makeup in this color? If so, this may be her "signature party look". There are several shades from which to choose. What you pick can influence the overall look and feel of your party. Soft, pastel colors will definitely give a romantic, airy feel. Stronger tones will suggest a more modern event. This will often go along with her personality. • Any spot can be transformed into a "think pink bridal shower theme" location. Just make sure to incorporate your color/colors throughout the room. This place will often be determined by your budget, and the number of guests. 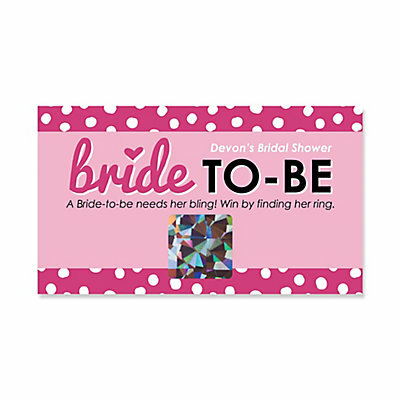 • Choose invitations with a design that reflects your color theme. Pink flowers, ribbons, or hats, are some of your options. A silhouette of high heels is also a cute idea. You may want to ask your guests to dress in pink, or bring their gift wrapped in pink. • Decorations for this theme can combine various shades of pink. You may also choose the bride's favorite shade. Create a contemporary look: Hang bright pom poms, drape colorful scarves or material over tables. Then add funky accessories. • Games for your think pink theme. Play music that goes along with the tone of your party. You can also select songs using the word pink, or artists such as Pink, or Pink Floyd. Your menu can continue your theme, with any appropriate colorful choice. • Make a delightful pink punch recipe for your party. Girly Girl Favors: any of the following, in pink, of course! • Go from Think Pink party page, to Bridal Shower Ideas For You homepage.